I’m very excited to have found this information. 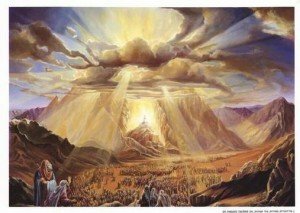 As I was meditating on The Lord I thought I heard Him say, my transfiguration was on mount Sinai. I quickly begun my research to clarify what God had spoken. Previously I had read that the transfiguration had taken place on mount hermon but after reading this I know in my heart that what I heard God speak to my spirit is what He said. Thank you! And God bless. I stumbled across this page because I was looking for possible evidence that the Transfiguration happened on Horeb. Reason being I stumbled across something in the Old Testament similar to what you wrote. Furthermore, though, I also noticed that Elijah, in 1 Kings 19, had his “burning bush experience” on Horeb when he ran from Ahab and Jezebel. Except Elijah heard a still, small voice. The correlation here is that BOTH Elijah AND Moses were running away/lost in the wilderness, and then came to Horeb, the Mount of God, and had a great Revelation to who God was, and it was Moses and Elijah who both appeared with Jesus at the Mount of Transfiguration. Thanks for these great thoughts and correlation. When you mentioned the passage in Deut 18:15 about Moses telling them another prophet would come and they need to listen to him, it would make sense that he is speaking of Joshua (who would lead them into the promised land). Since Joshua is Yeshua (or Yehoshua), the double meaning that Yeshua would be the prophet to listen to in their time, and prophetically Yeshua (Jesus) in the days to come. Thanks again.